BERLIN: Philip Hammond and David Davis have made a direct appeal to German business leaders to help them forge a Brexit deal to secure the future of Britain’s financial services. The chancellor and Brexit secretary travel to Germany on Wednesday on a charm offensive they hope will shift the EU’s implacable opposition to services being included in a final deal. They said they were seeking a bespoke deal with the EU described as “the most ambitious in the world” that should “cover the length and breadth of our economies including the service industries — and financial services”. They warned that a continued integrated approach to banking after the UK leaves the bloc was vital if Europe was to avoid a repeat of the 2008 financial “catastrophe” and the eurozone crisis that followed, prompting bailouts in Ireland, Portugal and Greece. Their trip comes just weeks after the EU warned that a deal involving the City of London was not on the table as long as the UK insisted on exiting the single market. The Financial Times also reported on Wednesday that the EU had sent a flurry of memos to 15 industries in November and December ranging from airlines to mineral water producers to “be prepared” for regulatory no man’s land in March next year if Britain crashed out of the EU without a deal. The memos are said to explain why Davis accused the EU of trying to spook British business and why he had taken advice on the legality of EU warnings to businesses that Britain would be treated as a “third country” after March 2019. 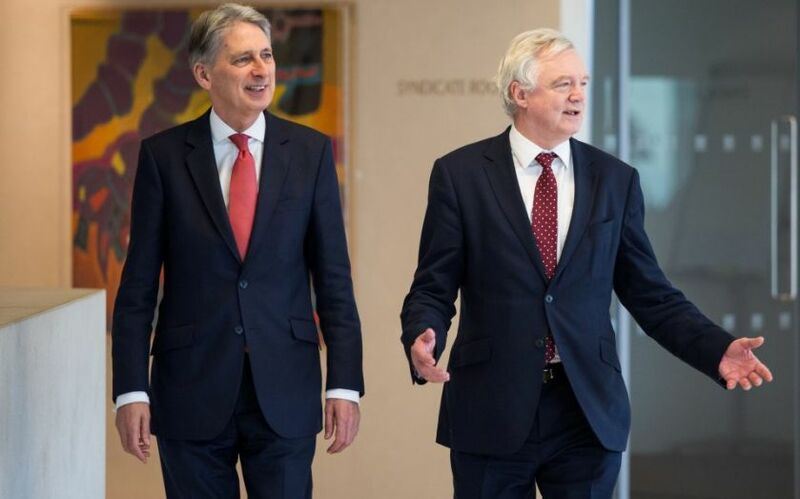 Hammond and Davis said Britain was seeking a deal that “supports collaboration within the European banking sector, rather than forcing it to fragment”. Europe, in partnership with the UK, had worked hard “to make sure such a catastrophe doesn’t happen again” by tightening financial regulation, Hammond and Davis wrote. “That work shouldn’t end because the UK is leaving the EU. On the contrary, we must redouble our collective effort to ensure that we do not put that hard-earned financial stability at risk,” they wrote in Frankfurter Allgemeine, one of Germany’s more respected newspapers, that was at the centre of a storm in October after it claimed Theresa May had “begged” for help in Brexit talks from the European Commission president, Jean-Claude Juncker, during a dinner. A failure to seal a deal including services could be catastrophic for the City of London, which is the financial capital of Europe and depends on the pan-European financial passport to operate across the sector in all countries in the EU. Britain’s decision to leave the EU has already caused havoc in the financial services sector with thousands of jobs in corporate banking, asset management and insurance being moved to Frankfurt, Luxembourg, Amsterdam, Paris and Dublin. The Hammond-Davis remarks and speech by the chancellor in Berlin on Wednesday night are the opening shots in what promises to be a challenging 10 months of negotiation on the final Brexit deal. Barnier said the result would be a consequence of “the red lines that the British have chosen themselves. In leaving the single market, they lose the financial services passport”. The EU could treat some British financial regulation as equivalent to EU law after Brexit, but would not give financial firms a general “passport” to do business in the single market, Barnier said on Tuesday. The City of London would like to retain the easy access to the EU market it has now, but Barnier said this was not possible. “[Britain’s] financial services cannot benefit from a passport in the single market nor from a system of generalised equivalence of standards,” he said. When Hammond and Davis meet business leaders in Germany, they will aim to dismantle that argument by appealing to the “shared vision” of business interests. They say that trade between the UK and EU 27 is worth €750bn (£660bn) a year – and a quarter of EU exports to Britain, worth €113bn, come from Germany, more than any other EU country. They also claim that Britain’s departure from the single market was not incompatible with the EU’s insistence that third countries could not enjoy the benefits of being a member state. They also called for barrier-free trade to continue. “As two of Europe’s biggest economies, it makes no sense to either Germany or Britain to put in place unnecessary barriers to trade in goods and services that would only damage businesses and economic growth on both sides of the Channel,” they say. Davis has claimed the UK can have a bespoke deal described as a “Canada plus plus plus” which would be similar to the EU trade deal with Canada “plus the best of Japan, the best of South Korea and the bit that is missing, which is the services”. While the EU has argued that this is impossible, Theresa May has argued that Britain’s deal with the EU is bound to be different to Canada, Norway or Japan because of the regulatory alignment that flows from four decades of EU membership.